The beauty of Washington State lies in its acres upon acres of greenery. However, our region isn’t only visually green -- we also have a reputation for green living. In 2014, STAR Communities named Seattle the most sustainable city in the nation. Seattle has since remained an urban beacon of sustainability. In 2015, the city implemented a citywide composting system in an effort to manage landfill crowding. Today, many residents are taking initiative by composting in their own backyards, proving sustainable living is more than possible in an urban community. Here’s how you can get started. Since 1988, Seattle has been a pioneer of waste disposal improvement. That year, the city planted the seeds for its continuing efforts toward landfill mitigation when it banned yard waste from the garbage. 17 years later, recyclables were added to the list, and the city began curbside food waste collection. In 2009, all residential properties were required to take part in either food and yard waste collection or backyard composting, and multi-unit residences followed suit in 2011 when they were required to provide compost collection services for residents. The latest development came in 2015, when Seattle began to enforce its current municipal codes banning food waste from the garbage. “Food waste requirements will divert an additional 38,000 tons of food scraps from the landfill via composting. This will help Seattle achieve its goal of recycling and composting 60 percent of waste. Before the ordinance, Seattle sent approximately 100,000 tons of food waste 300 miles to a landfill in eastern Oregon each year. This resulted in higher costs and greenhouse gas emissions. *Meat, fish and dairy scraps are typically not suitable for backyard composting. Include these in your cart for pickup. Watch the City of Seattle’s instructional videofor an easy-to-follow rundown. Fats, oil or grease (Pour these into an empty can, then freeze and dispose in garbage) Styrofoam Pet waste and litter Refer to the Seattle Public Utilities’ handy do’s and don’tsfor a comprehensive list. If you are in Seattle and would like to begin composting on your own, you can first request an exemptionto opt out of residential pickup service by calling (206) 684-3000. Your next steps should typically include the following. Green Cone:No turning required. The shape and configuration distributes solar heat. Digests about 11 pounds of food waste per week. Worm bin:Red worms go to work decomposing layers of scraps and bedding. Compost tumbler:A crank handle removes the need for manual turning. If odors become a concern in or around your home, try sprinkling a couple inches of sawdust or peat over the top of your food scraps or compost pile. A common metaphor compares a healthy compost pile to building a layer cake. While layering is key, composting is ultimately simpler than baking. Glance at this maintenance guidefor a play-by-play of the following basics. While not a hard-and-fast formula, the suggested ratioto maintain includes 2 parts brown/dry material and 1 part green/juicy material. Your compost pile shouldn’t be dripping wet, but keeping it damp will assist with natural breakdown. Occasional turning will also speed up the process, and airing out your pile will prevent excessive odor buildup. Some processes vary based on your bin of choice, so be sure to review any special instructions included with your receptacle. 3. 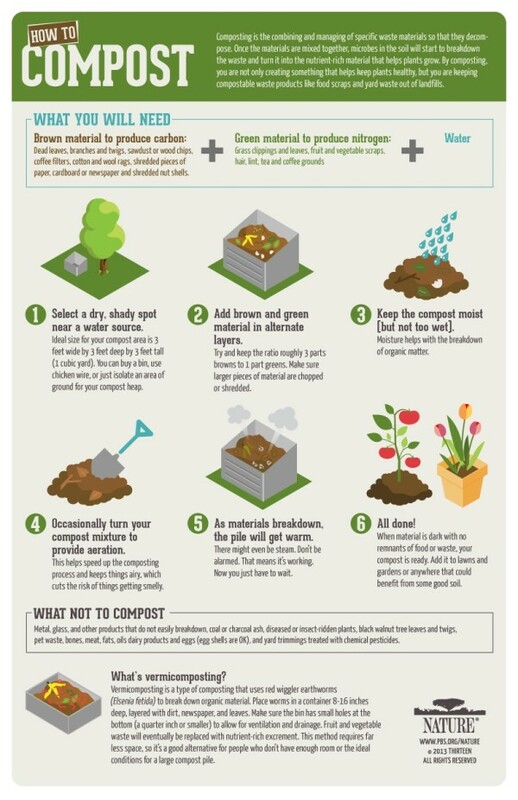 Put your compost to work in your garden or on your lawn! At Carpinito Brothers, winner of the Best of Kent 2016 Best Nursery and Garden title, we’re proud to offer compost mulch at our Kent location and for local home and business delivery. Our mulch is a rich blend made from composted residential yard debris and local forest by-products, and is ideal for soil amending, landscape top cover, weed prevention and moisture retention. A foundational layer can help you prep to lay your finished compost. It also makes an excellent addition to your garden when paired with your homemade compost. Contact us today to boost your landscaping project!